Fixing “FROZEN.” Yes the Disney Hit is Great but Could Have BeenGreater. So, I really enjoyed the Disney’s latest CG animated movie. It really resonated with me in a few ways that I suppose I should be embarrassed by–what with me being a male who is thoroughly into adulthood. However, there were some huge problems with that film. Three, to be exact–three missed opportunities with story, humor and music. I’ll start with the part that I am least qualified to criticize–the music. I can’t sing and I’m not musical, really, at all. However, I am married to a professional singer and actress who happens to be immensely talented and knows her stuff. One of the main complaints from her about the film was that the music had an over all “pop” feel that really clashed with the setting of the story. I agree with this. What’s more is that the film sets up a musical theme in the very first scene which it then quickly abandons. It was a shame, since I don’t know anything about folk music from northern Europe and it would have been nice to hear a style of music I haven’t already heard too much of. That said, I tend to forgive the music, as the lyrics and context generally make up for it’s poppish, somewhat cliched sound. In fact, I was very pleased to find that the songs in “FROZEN” generally don’t fall prey to what I call “Single Plot Point Syndrome.” I’ve seen a lot of musicals in my day (as the son of a huge fan of musicals and the husband of someone who has performed in quite a few of them). I loathe songs that exist solely to remind us over and over that a thing has happened. My favorite example of this is from “PHANTOM OF THE OPERA.” That one song about them having a masquerade? I’m not sure why that needs to be a whole song. They’re having a maquerade. Yes, indeed. We see them in masks as they sing it. Why do we need this song? I think the only song that sticks out in my mind as being afflicted by SPPS in “FROZEN” is the song Olaf sings about what he would do if he could experience summer. It’s such an adorable song, though, so I didn’t mind it. Or I wouldn’t have minded it if it weren’t for who sings it. This brings us to my second criticism about “FROZEN.” That stupid f**king snowman. I know! I know! There is a HUGE contingent of Olaf fans out there. 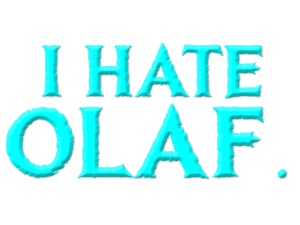 One of my favorite blogs even claimed Olaf was the best thing about “FROZEN.” But he isn’t. He’s the weakest thing. If not, why isn’t he in the whole movie? He shows up a third or maybe halfway in. Sure, there’s the Proto-Olaf they build as children, but he doesn’t turn into a chirpier version of Woody Allen until he inexplicably shows up when the sister and her guy pal go looking for Elsa in the mountains. And when he does, he brings buckets of laughs, right? Well, not to me, but that’s beside the point. 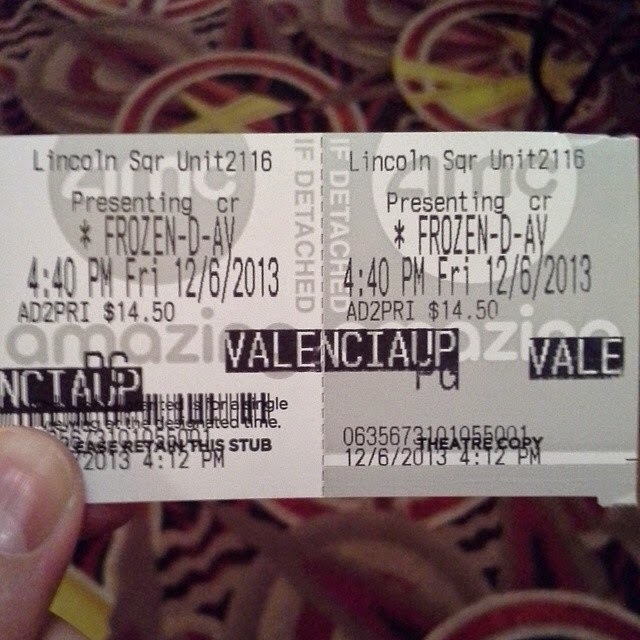 Sure, the hipsters sitting next to me in the theater laughed their asses off at Olaf, but that doesn’t matter. Not to me. Why? Because we already had an awesomely warm, funny, comic-relief character–the reindeer. Yep. He was charming, had great timing, and really lightened the mood nicely. He wasn’t even a talking reindeer so there was much less to strain my suspension of disbelief. I think if I was a little kid, I’d have an even easier time imagining this adventure could have really happened. As an adult, I just didn’t know why Olaf was there. Elsa didn’t really create him. I mean, I guess she did with her sister’s help when they were little kids. But that’s not what I mean. When the Fairy Godmother in “CINDERELLA” conjures Cindy’s dress, it’s a dramatic, beautiful moment. When Elsa conjures Olaf, it happens off-screen. What the hell is that? So, I say cut the boring, cliche-ridden character out of the film entirely. It works just as well without him. Either that, or make him matter more and put less of an emphasis on how he’s the comic relief. Every single joke he has hits the punchline on the head. None of it seems indigenous to the situation, really. It’s like he’s a little Deus Ex Joke Machine wondering through the story. That is, until he actually does become useful toward the end of the film. But really, I think Anna could have gotten out of her situation on her own. She is a wonderfully competent character, after all. While I do feel that Olaf really did ruin every scene he was in, for me, I don’t think he was the biggest mistake of “FROZEN.” The biggest mistake of “FROZEN” was how they handled Elsa’s at-home-exile. Once her parents lock her up, the focus of the film abruptly shifts to her sister and stays there for far too long. The film expects us to assume that being locked away is inherently unpleasant. Which, I suppose is fine, but it’s not that interesting, is it? Plus, if we had seen what she went through as a person, cut off from the rest of humanity, it would have made her “coming out” song in her ice castle that much more triumphant. Just imagine the scenes where she sneaks out of her room and accidentally freezes dinner or almost turns the maid into an ice statue. Imagine she has a few more break-out attempts where she is soooo very much tempted to go over to the dark side, but she doesn’t. In her heart, she’s still a good person, so she goes back inside (literally and figuratively) on her own. Exiling herself–which she can then use to help fuel her rejection of her responsibilities to lead and keep her power in check. It would have made her break from “civilized society” that much more interesting and her motivation that much more ambiguous. Has she truly gone evil? Obviously, when she sings her “Let it Go” song, we’d know she hasn’t. But it’s called “drama,” right? Wouldn’t all of that have made her character so much more interesting? As she is, she’s a great role model for girls, which I definitely appreciate. However, she could have been a much more resonant character for everyone watching. It’s almost as though the filmmakers felt pressure to make her a typical Disney princess. While “FROZEN” is a legitimately enjoyable film, you have to admit, it would have been a better movie like this. Previous PostPrevious Writing Update: My first post is up at “Pete Saves Hollywood”!